Hmm. It can’t be can it? I hope it is, but it probably won’t be. I’ll have to keeping watching to find out for sure. 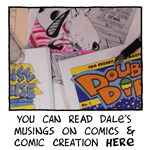 Thanks for the great comic & the behind the scenes look at your process, Dale! Took me a second glance to notice Emma in the window! I think Watusi may have some trouble ditching his new gal Friday! By the way, did you base Amis on anybody particular? He reminds me of that old character actor Frank Nelson (Often known for playing a salesman-type character who often said “Yesssssssss?” to Jack Benny or Lucille Ball). I didn’t need the second glance to enjoy Emma’s glowering. Archibald’s Antiques attracts the cream of the well-to-do of Wonder Valley! I like that tile floor. 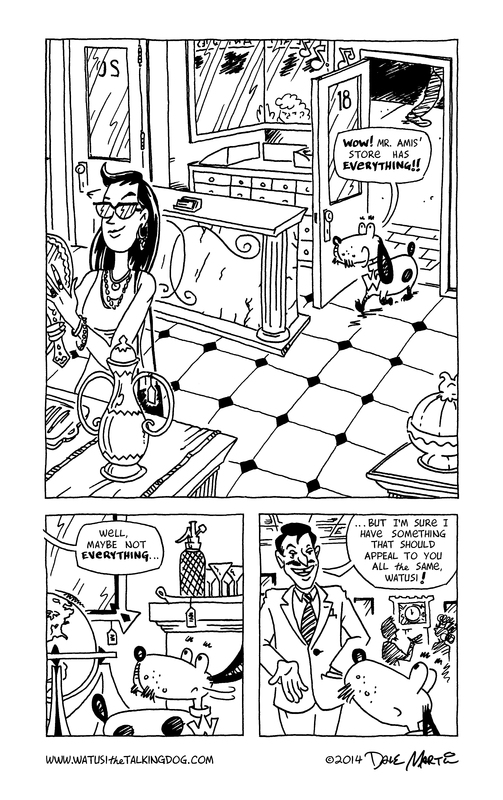 While there is linoleum in that pattern, I’m sure that in Mr. Amis’s store, it’s individual ceramic tiles. It gives the place a touch of class. You’re right about the linoleum quality of that pattern– I guess I should have added more reflection to give a better sense of inlaid tile. Thanks for the helpful comment! That sounds relatively ominous… I can only hope… nah!! !